I see rats running on my roof and want to trap them but I don’t think they will work up there. The shingles are slippery and it’s not flat. Can I use a one of our live traps effectively on my roof? Live traps can be used most anywhere if the target animal is active and the trap is both secured and baited with something that will get the animal inside. The use of a live trap out in the open, where animals are foraging and running, can certainly work. The following image shows a good trap set on a slanted roof. In this situation, the targeted animals were leaving the attic from the corner so placement needed to be as close as possible to their exit hole. The trap needed to be secured which can be done with nails or staples. The only warning here is that it’s best to use silicone caulking when using anything to anchor the trap. Apply the silicone to the nail or screw when it’s first installed. When the trap is removed, don’t take out the nail or screw but instead drive it all the way in. The silicone previously applied will insure the hole is water tight and this practice will keep the roof water tight. Is it possible to live trap rats in a tree? Live traps can be set most anywhere when targeting rats. The most important factor seems to be whether the location is where they are willing to feed. If you suspect you have roof rats or some other rodent active in a tree, chances are high they are finding food on it making live trapping a possibility. Roof rats will commonly forage on trees which yield nuts such as acorn, pecan and walnut. From these trees they’ll find their way onto rooftops and then inside the structure. 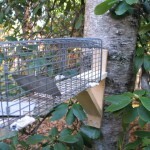 If you are seeing activity in trees close to the home, make some live trap sets to help thin the local population. Failure to remove and relocate local activity close to the home will undoubtedly lead to some getting inside. Once inside they’ll be harder to control. This picture shows a good tree set made with one of our a live traps. Good traps to use for this set include our 5x5x16GREEN, LT5518RD and our 3.5X3.5.24REPEATER. All these models can be strapped to branches using plastic cable ties, nails or screws. They can also be anchored with more elaborate mounts like the one pictured above. This is actually a bird feeder mount which serves as a great “ledge” on which to rest a cage trap. Use some PECAN PASTE along with a good quantity of the nuts the host tree yields when baiting. This combination will both enable the rodents to find the trap quickly and give them good reason to enter.